Duke Besozzi is a guy Dody and me were in first grade with. He’s a Thoreauvian and a logger in NW Connecticut where we grew up and, like Dody’s son Jay, he’s survived the ongoing building crash just fine. A lot of loggers in the Northwest Corner have had to sell their skidders and hang up their saws. These days Duke’s been walking the woods looking for good big old white oaks to cut and saw for spars for the team working on the restoration of the Charles W. Morgan, the last remaining wooden whaling ship in the world. And that’s what triggered this article. After talking to Duke, I did some reading on the Morgan, which was launched in 1841, during the heyday of the whaling industry. What I learned turned my mind to the current onslaught against unions in Wisconsin and across the US and to the kind of country the Koch Brothers and Gov. Scott Walker and their ilk would have us to return to. Let’s look first at what a sailor’s life on one of these vessels was like. On the Morgan’s eleventh trip, which took her to the South Atlantic from 1868 to 1871, the ship’s cook was a guy named John Harding. He signed on for a 1/145th lay--a share of the profits when the voyage was over. One of the perks of being the cook was keeping half of the slush fund. This term, still used today, referred to money made saving the leftover grease from boiling salt beef or pork and selling this slush as lubricant whenever the ship made harbor. That earned Harding $18. 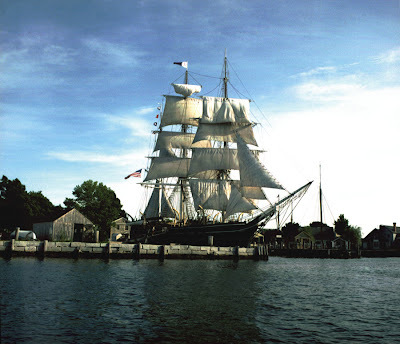 His lay, when the Charles W. Morgan returned to New Bedford, MA after 1028 days at sea, amounted to $328.19. Unfortunately, that was before money was taken out to repay his advance and for expenses on shipboard. Like clothing, which tends to wear out during three years at sea. At the end of the voyage and 147 weeks of grueling labor, Harding owed the shipowners $432.91! There, in a nutshell, is the world the capitalists dream of returning us to. But their dream also has an answer in the history of the Charles W. Morgan. Back in 1841, when the vessel was being built at the Hillman Brothers shipyard in New Bedford, the Morgan family who commissioned it were pressing for a quick launch. That was when the shipwrights downed tools. Rejecting Hillman Brothers’ dawn-to-dusk work schedule, the workers struck for the 10 hour day. The strike pushed back the scheduled launch by a week, then two weeks. The shipyard bosses caved and a deal was struck that the workday thenceforth would be 10 hours and a half long. And that’s the capitalists’ nightmare—the united power of the people who actually do the work. Thanks Jimmy! The video-footage about sustainable, small-scale logging made this posting (and the historic info about early 19 century job-actions wasn't too shabby either).